The live camera feeds will be available according to each of the horses' daily schedules, listed below their overview. Live footage will extend as the mares get closer to their expected foaling date. With determination and gusto, Starr Bear19 pushed her way up to standing last night shortly after being born. Starr Bear19 stands from National Museum of Racing on Vimeo. Just one month ago, we were all relieved when Starr Bear delivered her First Dude filly. Today, we celebrate Starr Bear19 turning one month old. 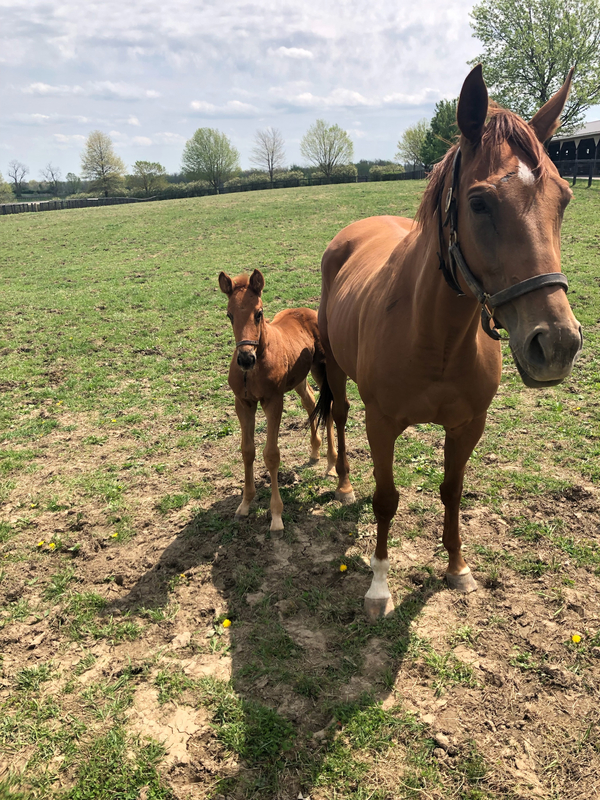 Both mare and filly are great and enjoying the paddocks at Gunston Hall in Kentucky. Starr Bear and her filly left for Kentucky today. For the time being, the Double Diamond cameras will be turned off. We will keep Foal Patrol updated with occasional blogs and photos until their return to Florida. Please stay tuned! Here is a video of their travel preparations. Starr Bear and First Dude filly depart for Kentucky from National Museum of Racing on Vimeo. Tomorrow at Double Diamond Farm Starr Bear and her filly will say farewell for a couple of months. Starr Bear will travel to be bred to Exaggerator at Winstar Farm in Versailles, Kentucky. Both are in good health for the drive and the plan is for them to come back to Florida in a few months. Please keep checking in for updates!